I'm working with Tracy on a fun project of hers, and she's sharing her amazing Chocolate Chip Banana Bread recipe with me. This is moist, flavorful, chocolatey bread that makes your house smell unbelievable. It's delicious warm out of the oven, the next day...(if it lasts that long), and even with a scoop of ice cream on top. This recipe is unbelievably easy – all you've got to do is measure-and-dump. You don't need a mixer; just a few extra-ripe bananas and an appetite. Let's get baking! Sift together 1 cup of flour with dash of salt, 1 tsp baking soda, and 1 tsp baking powder. 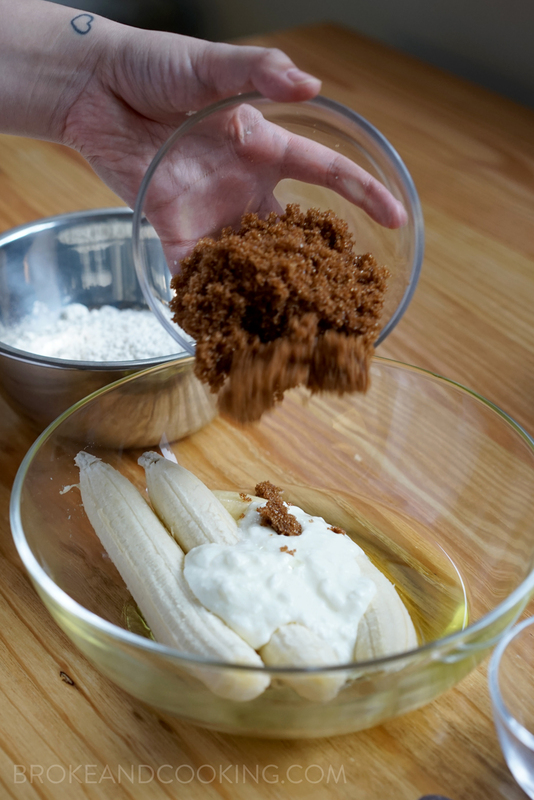 Place 3 ripe bananas in a large mixing bowl and add 3/4 cup dark brown sugar, 3 1/2 oz. oil, 3 1/2 oz low fat plain yogurt, 1 egg, and 1 tsp vanilla. 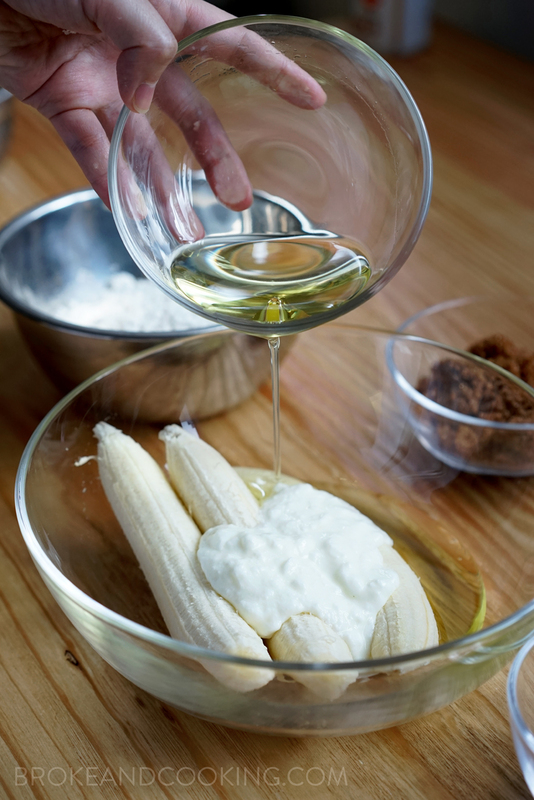 Use a whisk to break up the banana and mix it all together. Add the dry ingredients and wish until combined. Don't over-mix, it's nice to have large bits of banana throughout the bread! The more you mix, the denser the bread will be. Toss in up to 1 cup of chocolate chips, stir to incorporate. Pour into a greased loaf pan or your desired mold and bake at 325ºF. For a loaf pan, bake for 45 minutes to an hour until a toothpick comes out clean from the center. Muffins bake for 25 to 30 minutes.